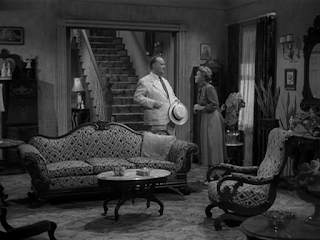 "The Right Kind of a House" is a good example of a tightly written short story that was adapted for television in classic style. Slesar's story begins on a slow day at Aaron Hacker's real estate office, when a car with a New York license plate pulls up and a fat man in a colorless suit walks in. His name is Waterbury and he is interested in a house for sale on the edge of town. The eight-room colonial is listed for $75,000 but is worth $10,000 at most. Old Sadie Grimes lives there and it has been for sale since her son died, five years before. The house is not well-maintained, but Hacker thinks that the high price tag means that she does not really want to sell. Waterbury drives out to Sadie's house, where she welcomes him and offers him lemonade. Sadie tells Waterbury that she is not willing to lower her price and he capitulates, agreeing to it with minimal argument. Serving the lemonade, she tells him the history of the house and of her family, including her late son Michael, who grew up without a father and left home. He came back after nine years with a small suitcase, agitated because he was in trouble. A man came the next night, argued with him, and shot and killed him. Sadie learned that her son and the other man had stolen thousands of dollars and that her son had run off with the money, eventually going home and hiding it in the family house. Sadie knew that his killer would return one day for the money and she knew that he would be "willing to pay too much for an old lady's house." Waterbury, his "head rolling loosely on his shoulders," comments that the "lemonade is bitter," and we realize that Sadie has poisoned her son's killer. The ending of "The Right Kind of a House" is a classic twist, where the payoff is so subtle that it takes a moment to dawn on the reader just what has happened. 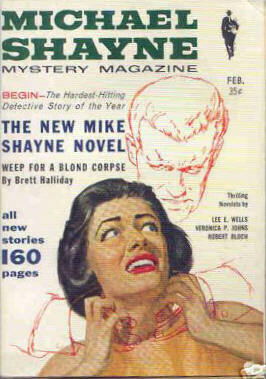 Slesar's tale was published in the February 1957 issue of Michael Shayne Mystery Magazine. 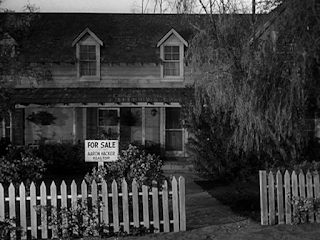 Robert C. Dennis adapted Slesar's story for Alfred Hitchcock Presents as "The Right Kind of House" (dropping the indefinite article) and the show was broadcast on March 9, 1958. Dennis's script uses the classic technique for taking a story off of the page and putting it onto the screen; he shows rather than tells and uses flashbacks to portray events that are only referred to in the source. 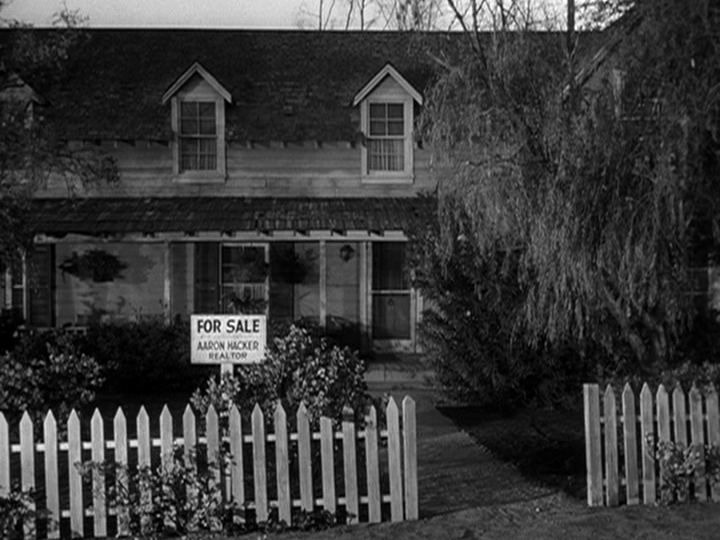 The show begins with shots of Waterbury driving into Ivy Corners and stopping to admire Sadie's house, noting the name on the For Sale sign. The script then follows the story closely, though it is notable that Dennis solves a slight technical problem that existed in Slesar's original. The price of the house is reduced to $50,000, which is still five times what it is worth. This will be important later in the episode. There is an interesting shot (Don Taylor directed the show) when Waterbury first enters Sadie's house: the camera starts way back to show the whole living room and very slowly dollies in until it frames Waterbury and Sadie in a two-shot as they sit down to talk. As Sadie tells Waterbury the story of the house, we see her son Michael in a series of flashbacks. The script expands the story's timeline so that, rather than coming home and getting shot the next night, Michael comes home, stays for the summer, and is killed later on. Director Taylor's shot choices and camera movements are above average and serve to tell the story quickly and effectively. As Sadie, Jeanette Nolan gives an outstanding performance, her expressions and movements showing love, concern and forgiveness for her son, emotions that later change to ones of resignation and resolve. Robert Emhardt plays Waterbury and his high, nasal voice is unforgettable, making it important that Sadie heard the voice of her son's killer, even if she did not see his face. In the flashback where Michael is killed, we hear "Hello, Mike" in what is clearly Emhardt's voice. Sadie hears a tussle downstairs and then a shot; she rushes to the landing and sees the legs of the killer, though those legs do not look like those of a man of Emhardt's girth. In another flashback, Sadie is questioned by a local policeman and a New York detective and she lies about having seen Michael's little black bag. She learns that he was involved in a bank robbery where over $200,000 was stolen, which fixes the small technical problem from Slesar's story--it does not make sense that a man would pay $75,000 to buy a house to recover "many, many thousands of dollars," but it is understandable that one would pay $50,000 to find $200,000 in hidden loot. Why does Sadie lie to the police about having seen the bag? She admits to Waterbury that she lied and that she never searched for the bag. Perhaps her goal from the start was to find her son's killer and bring him to a sort of rough justice by poisoning him; by making it known that the money was never found she ensured that the killer would one day return. The final scene of the show is a tense one, when Sadie and Waterbury reveal themselves to each other. Waterbury's salesman's smile is frightening, as he threatens the older woman in a calm voice, but she gains the upper hand by pointing out that she did not tell him her story until after he had drunk his lemonade. He collapses on the floor as she rocks silently in her chair, recalling the rocking figure of Eternal Motherhood in D.W. Griffith's Intolerance (1916) and Walt Whitman's "Out of the cradle, endlessly rocking"--here, the figure of the rocking woman represents the justice that awaited the guilty man sitting across from her. 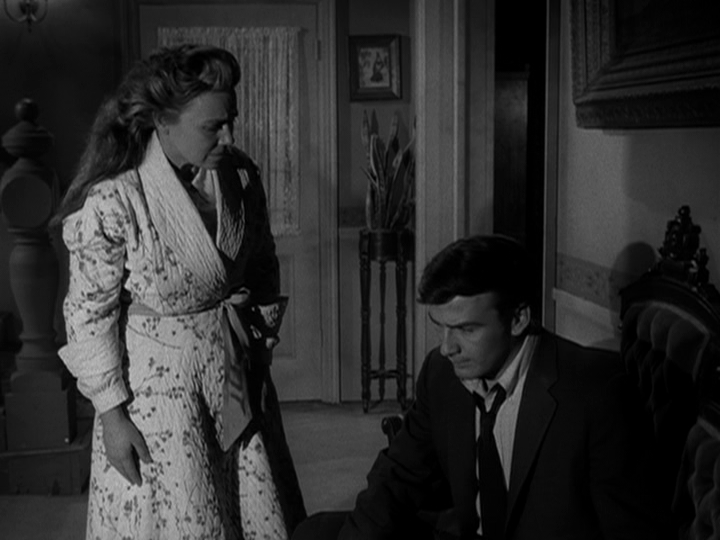 As in the prior Slesar episode, "On the Nose," the musical cues in "The Right Kind of House" are especially good, and Don Taylor works with director of photography Lionel Lindon to create a shadowy. noirish mood in the flashback scene where Michael is killed..
Robert C. Dennis (1915-1983) wrote hundreds of scripts for television in his career, including 30 for Alfred Hitchcock Presents. He worked on the script for "A True Account" along with Fredric Brown. He also wrote for Batman and The Outer Limits. Don Taylor (1920-1998) began his career as an actor in the 1940s but also began directing in the 1950s, mostly for television. 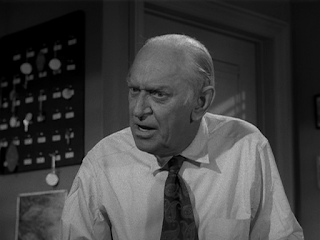 He acted in one episode of Alfred Hitchcock Presents and directed seven. Robert Emhardt (1914-1994) had a thirty year career in TV and movies and appeared in seven episodes of the Hitchcock series, including De Mortuis. Jeanette Nolan (1911-1988) began her career on radio in the 1930s and moved into movies in the 1940s and TV in the 1950s. 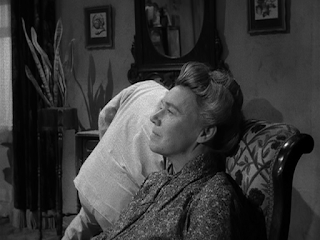 She played hundreds of roles on TV and was seen in Fritz Lang's The Big Heat (1953) and Hitchcock's Psycho (1960), where she was the voice of Mrs. Bates. She was on Alfred Hitchcock Presents four times, and she also had roles on The Alfred Hitchcock Hour, Thriller, The Twilight Zone, and Night Gallery. James Drury (1934- ) plays the role of Sadie's son Michael in the flashback sequences. This was his only role on the Hitchcock series but he would later star for nine years in the lead role of the series, The Virginian. 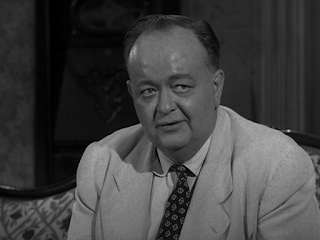 Finally, in the small role of realtor Aaron Hacker is Harry O. Tyler (1888-1961), who also appeared in "The Dangerous People" and "And So Died Riabouchinska." Tyler's list of movie and TV credits is long and includes eleven episodes of Alfred Hitchcock Presents, the Marx Brothers film A Night at the Opera (1935) and the John Ford classic, The Grapes of Wrath (1940). "The Right Kind of House" can be purchased on DVD here or watched for free online here. IMDb. IMDb.com, n.d. Web. 25 May 2013. "The Right Kind of House." Alfred Hitchcock Presents. CBS. 9 Mar. 1958. Television. Slesar, Henry. "The Right Kind of a House." 1957. Clean Crimes and Neat Murders: Alfred Hitchcock's Hand Picked Selection of Stories by Henry Slesar. Ed. Alfred Hitchcock. New York: Avon, 1960. 85-91. Print. Wikipedia. Wikimedia Foundation, n.d. Web. 25 May 2013. Don Taylor may have learned a lot about film noir technique on the set of THE NAKED CITY from crack cinematographer William H. Daniels and director Jules Dassin. Taylor played the second lead role as Homicide Detective Jimmy Halloran in Dassin's classic 1948 crime drama and police procedural. Why was Robert Emhardt cast in so many episodes of the Hitchcock series? Was it because he could have passed for a younger Hitchcock? Or was it because Emhardt – like the actress Phyllis Thaxter – seemed to belong in "l'univers hitchcockien"? Whatever, Emhardt was THE RIGHT KIND OF ACTOR for ALFRED HITCHCOCK PRESENTS and THE ALFRED HITCHCOCK HOUR. I'm right there with you in my admiration for Emhardt, but for me the quintessential Hitchcock TV actor will always be John Williams. A neat little story by a very good mystery/suspense writer. I read it as a youngster when it appeared in The Reader's Digest and have never forgotten its twist ending. It was also included in a 1986 Avon paperback collection of Slesar's stories, entitled Murders Most Macabre. Thanks for reading, John! I follow your Monster Magazine blog daily. Is there any chance you have a copy of the February 1957 magazine? I'm trying to find one as a gift for a friend. I'm sorry to say I don't have any magazines for sale. I looked online but could not find this issue for sale anywhere. The best places to look are eBay, Amazon, or AddALL. WorldCat can tell you what libraries might have it. Keep checking the internet sites and eventually it will turn up for sale. You're probably looking for that one for The Frightening Frammis by Jim Thompson. That story makes that issue very collectible, pricey, and hard to find. Keep haunting eBay. That's your best bet. I enjoyed watching the set-up for The Right Kind Of House, Jack, but y'know, if you watch to many Hitch half-hours they become predictable, as fr'instance, once I saw Robert Emhardt enter the real estate office I knew he was up to no good, though it's always fun to see him in traveling salesman mode, whether on Hitchcock's show or Andy Griffith's. The person who commented on Emdhardt's resembling a younger Hitch was pretty sharp. I think that physically the same could be said for Emdhardt's fellow Hitch semi-regular Robert H. Harris, a sort of urban version of the same type, though Harris occasionally played benign or eccentric types without Emhardt's American Gothic air of menace. 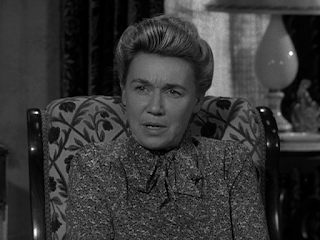 Jeanette Nolan was also safely in her comfort zone in this one. Well made as it was I guessed the final twist when Nolan's character said she was going to get a glass of lemonade for Emhardt. The back story hadn't even started. There was no reason to believe that she'd have it in for Emhardt. Thing is, in the Hitch universe things follow a certain pattern. The potential for conflict and/pr crime was adumbrated in the realtor's office, so my inner bloodhound was already hot on the trail. The lemonade was the kicker. Emhardt is one of those actors I appreciate more and more over time. I just saw him on Andy Griffith again recently and loved it.